One great advantage of being on a boat? The easy access to all those magical secluded spots – the wonderful coves and bays that are inaccessible or difficult to reach from the mainland. Just to get you in the mood, here is a sneak preview of some of the most secluded spots in Malta and Gozo that you could visit on a boat charter with Azure Ultra. Hop aboard a wonderful Sunseeker motor yacht and begin the exploration! In the south of Malta, not far from the fabled St Peter's Pool in Delimara, lie two even more spectacular coves that never cease to astound visitors. Likely formed by whirlpools of torrential waters during the ice age, Il-Hofriet – 'the holes' in Maltese – features two perfectly round, large coves with an arch connecting them. The smooth cliffs carved from white limestone and azure waters lend the place a truly magical air. Prominent cliffs dropping vertically for several metres into the deep sea below give way to a pebble beach. 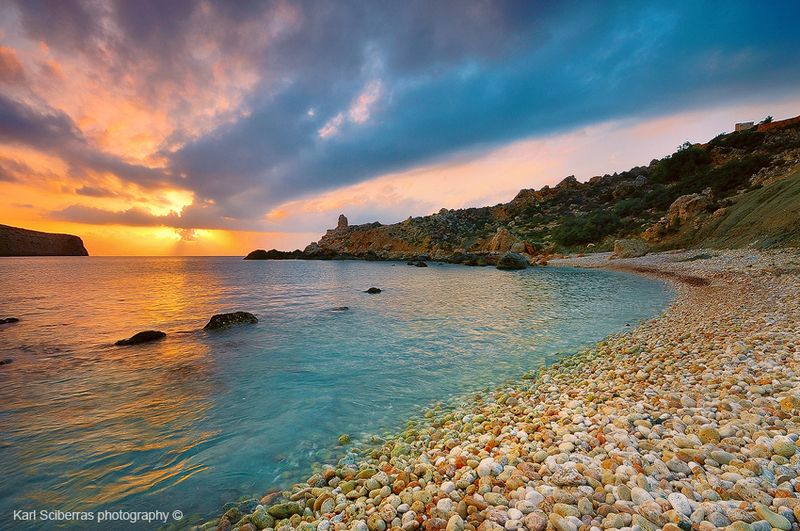 This area in the west of Malta is wonderful for snorkelling, kayaking and other water sports. Furthermore, it is not unlikely that you might enjoy the entire bay to yourself! Majestic blue clay hills slope down towards this pretty, golden sandy beach and aquamarine waters. In spring, the hills are further decorated with red and yellow flowers on a green carpet, creating a kaleidoscope of colour. A headland that gives Qarraba beach its name separates it from Riviera beach in the north. Meanwhile, Gnejna Bay lies south. Both these beaches are popular, but reaching this one requires a long, adventurous trek or a boat. You'll not meet many people here! Between the famous Hondoq ir-Rummien Bay in Gozo and the coast of Qala in the south-east of the island, a large rock sits solitary on the edge of a pretty little cove with a pebble beach, spying on Comino and Malta. Colloquially known by local boaters as 'wara l-blata' or 'behind the rock', il-Gebla tal-Halfa and its pristine surroundings retain their charm when other beaches become very busy during the summer season. Few places in Malta and Gozo are as spectacular as Dwejra. Then to find yourself there on a boat. Then to be almost completely surrounded by cliffs that have probably been carved by torrential ice-age whirlpools. Then to be there almost completely alone. It all adds up to the awe-inspiring experience of this wonderful place. These are just five of our favourite secluded spots in Malta and Gozo for you to discover. Depending on how the winds blow and the time available, the Azure Ultra crew will be delighted to show you around!